Learn about hosting websites with the virutal host function and using DDNS service with your NAS. 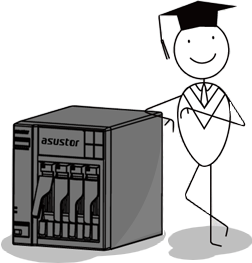 Learn how to migrate your hard disks and data to a different ASUSTOR NAS. Mount personal and shared CIFS folders to your NAS from another NAS or Windows and Mac computers. An overview of some of the different Rsync usage scenarios when used in conjunction with your NAS. Learn how to migrate storage volumes to a higher RAID level and expand their storage capacity.